One of the most beautiful towns in Viet Nam has celebrated its one-hundred-and-tenth birthday. Early buildings that went up in Sa Pa, in Lao Cai Province, were built by the French who ruled over Viet Nam at the time. Around the town are beautiful rice fields. To celebrate this birthday, photographers showed people the pictures they had taken of the town and the area around it. 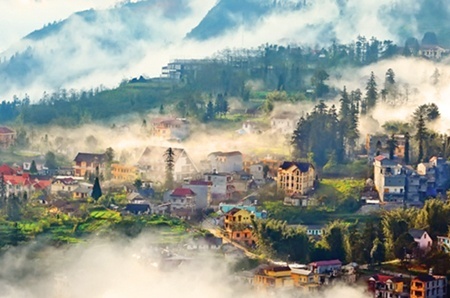 LAO CAI (VNS) — The famous town of Sa Pa in Lao Cai Province is celebrating its 110th birthday with various cultural activities. Famous for its stunning mountainous landscape and unique ethnic culture, Sa Pa attracts thousands of tourists every year. The cool climate and magnificent green vistas first attracted the attention of French colonisers in the first years of the 20th century. In following decades, hundreds of French-style villas were built in the area. Aiming to turn this town into a "summer capital", the French even built a railway route linking Ha Noi and Lao Cai. However, Sa Pa and its … [Read more...] about Happy birthday, Sa Pa!